Hawaii is home to more than 20 higher learning facilities, including both public and private institutions, as well as specialty schools offering programs in acupuncture and alternative medicine. Though the state of Hawaii is small in size, its numerous postsecondary education options can make choosing a school challenging. College-bound students in Hawaii typically look for desirable location, maximum affordability and reasonable program length. 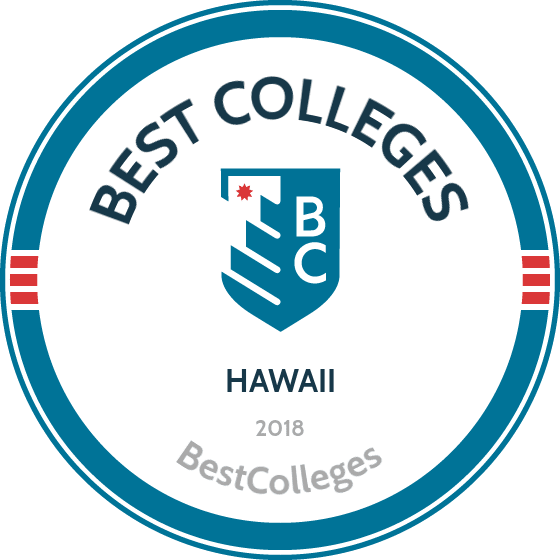 To help students compare colleges, we have applied our rigorous methodology to the latest education data to rank the best colleges in Hawaii, including the top four-year and two-year schools. The top four-year institutions in Hawaii are spread amongst the state's four major islands. The capital city, Honolulu, is home to the largest concentration of higher learning facilities in the state. The flagship University of Hawaii encompasses 10 campus locations; the state is also home to a variety of private four-year institutions, including Brigham-Young University and Hawaii Pacific University, which offer more specialized alternative education options. While some schools in Hawaii were established with religious affiliations, others are nonsectarian institutions. Though the number of postsecondary institutions in Hawaii is relatively low, there is much diversity among available programs; public, not-for-profit universities tend to attract more students and offer lower tuition fees, while private or specialized programs serve fewer students and demand higher tuition costs. Below you will find our list of top Hawaii colleges to kick off your search. The 100-acre Brigham Young University - Hawaii campus, located in Laie north of Honolulu on the island of Oahu, is an international center of learning in the Pacific. This Hawaii college is home to a diverse population of students from 70 countries. The university is run by The Church of Jesus Christ of Latter-day Saints, and students are required to follow the university's honor code, which is based on the church's standards. Combining secular learning and spiritual growth, its intellectual course content prepares students for a career and provides them with moral, ethical, and spiritual enrichment. One of the best colleges in Hawaii, the school is closely associated with the Polynesian Cultural Center, a popular tourist attraction. Most students hold paid part-time jobs either on campus or at the cultural center. Through the university's four sub-colleges, students can pursue undergraduate degrees in business and computing, language and culture, human development, and math and sciences. This Hawaii college, located in the heart of Honolulu, offers an academic selection that is tough to top elsewhere. It has 98 undergraduate majors, 85 graduate majors, 53 doctoral degrees, five first-professional degrees, as well as an even longer list of options for minors and certificate programs. The university is well known for its significant research in ocean and marine science. It is also highly ranked internationally for its academic focus on earth and environmental sciences. The campus plays a key role as part of the NASA coral study. UH Manoa is a no-smoking-permitted institution, a policy which includes e-cigarettes. To support this policy, students are encouraged to utilize the numerous smoking cessation resources provided. Once serving students as the upper division of West O'ahu College, the University of Hawaii-West Oahu maintains a consistent 24:1 student-to-faculty ratio. This campus excels as one of the best colleges in Hawaii, offering six bachelor's degrees and seven certificate programs in 33 study areas. The courses of study combine professional and applied content areas with a liberal arts foundation. The core emphasis integrates varied ethnic backgrounds with native Hawaiian culture. One of the newest programs at this Hawaii college, established with funding from the Office of Naval Research, is the STEM Center of Excellence. The center's projects will include improving lab space, develop a facilities management bachelor's degree, and creating a portal that measures and displays current weather conditions and seismic activity. Remington, a private, nonprofit college that operates campuses around the country, is one of the top professional schools in Hawaii. Remington offers courses during the day, evening, and weekends. The school's downtown Honolulu campus sits at the heart of a thriving urban community. Remington maintains relationships with many local businesses and organizations, creating opportunities for students to gain professional experience in their area of study. Organizations such as the Honolulu Police Department, the Hawaii Medical Center, and Clinical Laboratories of Hawaii all visit campus to advise students and offer deeper insight into their professional practice. The school offers academic programs at the diploma, associate, and bachelor's level. Students can pursue diplomas in massage therapy or medical billing and coding; associate degrees in criminal justice, clinical medical assisting, or business administration; and bachelor's degrees in criminal justice and organizational management. Founded in 1955 by the Roman Catholic Society of Mary, Chaminade is one of the only Catholic colleges in Hawaii and one of just three Marianist colleges in the United States. The school is home to more than 25 academic programs at the undergraduate and graduate level, spanning the liberal arts and humanities, math and science, business and communication, behavioral sciences, nursing, and education. Students can choose from conventional degrees such as English, biology, and accounting, along with unique programs such as environmental and interior design, pastoral theology, and criminal justice administration. Chaminade provides a wide selection of campus services and activities, including the Office of Student Activities and Leadership, which offers opportunities for out-of-classroom and co-curricular experiences that help students build leadership and communication skills. The school also hosts a campus ministry that offers worship services, special retreats, and active Christian community services and events. Community colleges and other two-year postsecondary institutions almost outnumber four-year universities in Hawaii. These programs are centered on serving both first-time college students in a variety of disciplines, as well as candidates interested in specialties like alternative medicine. With six branches located throughout Hawaii, the state's community college system comprises satellite campuses for two-year commuter students under the larger University of Hawaii network. Specialty programs in acupuncture and alternative medicine are available through the Institute for Clinical Acupuncture and Oriental Medicine and the World Medicine Institute, both located in Honolulu. Educational materials aimed at attracting college students to Hawaii boast the international appeal of the higher learning institutions in the state: Hawaii is home to world-renowned science and technology programs. According to the U.S. Department of Education, graduates of top two-year schools in Hawaii have been noted as earning up to 57% more than those with only a high school diploma. Search our rankings below to find the Hawaiian two-year school that best suits your needs. Kapiolani Community College is one of the 10 colleges in the University of Hawaii system. One of the best community colleges in Hawaii, the school offers over 25 academic programs for credit, some with selective admissions. The college is best known for their programs in culinary arts, hospitality, health services, and liberal arts and business education. The campus, located in Honolulu, is on the slopes of Diamond Head crater. Housing is not provided at the community college, but there are limited accommodations and resources available through the University of Hawaii at Manoa. Student services include counseling and advising, programs for Native Hawaiian students, disability services, study abroad programs, and the Alani Children's Center, which offers early-childhood care to children of students and employees. The school also offers a Veteran & Military Student Resource Center and earned the designation of Military Friendly School for 2016. Serving nearly 8,000 students, Leeward Community College offers more than 60 associate degrees and certificate programs. The school has one of the largest math and science divisions in the University of Hawaii Community College system, and the fastest growing degree program is the AS in natural science degree. There are college transfer workshops throughout the year and, in addition to offering transfer options in Hawaii, Leeward is a member of the Interstate Passport Network, which provides for easier credit transfer with member institutions in other states. Among two-year colleges in Hawaii, Leeward has the largest number of native Hawaiian students and offers a Native Hawaiian Center. The school also has the lowest tuition rates in the state and offers several different payment plans for students. The college provides extensive academic help including a writing center, math lab, and online tutoring. Other campus services include a student health center and assistance with job placement, and students can check out laptops and iPads while on campus. Honolulu Community College, founded in 1920 with 42 students, today offers 26 associate degrees and 32 certificates to 4,300 students. As one of the two-year colleges in Hawaii, HCC has direct transfer with the University of Hawaii at Manoa, the University of Hawaii at Hilo, and the University of Hawaii-West Oahu, and program-specific academic counselors are available for transfer assistance as well as information about registration, educational goals, and academic strategies. The main campus is located near downtown Honolulu with several other facilities dedicated to specific programs related to aeronautics, automotive and heavy equipment, and marine education. The school has affordable tuition as well as small classes with a 15:1 student to faculty ratio. Career services, available to students and alumni, helps students with both on and off-campus employment and offers individual career counseling appointments, assistance with resume writing, and interview skill development. Kauai Community College is located in Lihue, on the island of Kauai. The school offers multiple academic programs leading to AAS, AS, or AA degrees, as well as certificate programs. Students in the hospitality and tourism program complete a 225-hour internship in addition to their coursework, and those who complete the associate degree program have the opportunity to transfer to the University of Hawaii-West Oahu to complete their bachelor of arts degree in business administration. Offering several unique programs, such as the Kipaipai Program, helps make Kauai one of the best community colleges in Hawaii. Students accepted to this first-year experience program work with the student support coordinator and receive a scholarship for three semesters, a first-year experience handbook, and peer mentor support. The Wai'ale'ale Project, funded by donors and community foundations, is open to residents of Kauai and Niihai and offers free courses and academic support to students accepted into the program. Located in Kaneohe, Hawaii, Windward Community College provides career-relevant higher education pathways to all learners, particularly students who are part of the native Hawaiian community. WCC's academic catalog contains professional development opportunities, certificates, and associate degrees, all of which can be accessed through standard daytime classes or through flexible night, weekend, online, and hybrid formats. Distance education options are delivered asynchronously and facilitated through the Laulima platform. Students can pursue degrees in areas such as liberal arts, Hawaiian studies, natural science, or veterinary technology. These programs prepare students for further study at four-year colleges and universities. Like many community colleges in Hawaii, WCC assesses tuition based on residency status. All students may apply for financial aid, which includes scholarships for those pursuing careers in sustainable technology and community affairs. WCC also supports its students through personalized academic advising, student clubs, and career services. If you're thinking about applying to one of the best colleges in Hawaii, continuing reading to learn more about living in the Aloha State. Hawaii is unique among the United States. The only U.S. territory comprised entirely of islands, Hawaii was the 50th state to join the U.S. but is officially considered part of the Polynesian subregion, Oceania. From active volcanoes to rich Polynesian culture, Hawaii's lush scenery and tropical climate support a healthy tourism industry year-round. As the site of 11 U.S. military bases, Hawaii draws a steady influx of military servicemembers in both temporary and permanent residence on its many islands. Hawaii is especially appealing to students and professionals interested in studying the unique flora and fauna of the islands. Hawaii residents earn an average income of $69,515 a year. Over 30% of Hawaii residents 25 and older had a bachelor's degree or higher, according the U.S. census, while over 90% of Hawaiians in the same age group had at least a high school diploma; both numbers are above national averages in this category. Below check out our comparisons of some of the more popular regions. As a highly desirable place to live, college admission is competitive and the cost of living is especially steep in Hawaii, compared to the national average. Though moving to Hawaii for school may seem daunting, financial aid is available to those who qualify. Students 18 and older must show proof of state residency or of legal guardian state residency if they are under the age of 18. Details vary depending on individual rules and regulations. If a student is a minor at the time of college enrollment, the student must prove that his or her parents or legal guardians are residents in the state to claim residence themselves. To prove residency in Hawaii, a minor must show that he or she lives with their parent(s) or legal guardians in their household within the state. If the parents are divorced or separated, the minor must reside with the parent who lives in Hawaii. Minors must show proof that they lived with their parent in Hawaii before turning 18 as well as prove their intention to continue living with that parent until the school year begins. You must physically reside in Hawaii for at least one year prior to declaring residence. You must prove intent to make Hawaii your home; you cannot move to Hawaii simply to pursue cheaper college tuition. You should be able to prove that you are financially independent as an adult of legal age.